According to the National Association for the Education of Young Children, young children learn best through play and repeated experiences. Encouraging children to share through hands-on, cooperative activities is a great way to create teachable moments and help your preschooler learn this essential social skill. Use these fun and easy sharing activities for preschoolers at home or in the classroom. Played like the popular game, 'Hot Potato,' Shiny Apple is best played in a small or medium-sized group. Ask the children (and participating adults) to sit in a circle. Explain the directions and choose someone to hold the apple first. Start singing "Shiny apple, shiny apple, who's got the shiny apple? If you've got the shiny apple, you have won!" The person holding the apple when the song ends is the winner and gets to hold the apple first when the next round starts. By changing the classic game of 'Hot Potato' into a winning scenario, the apple becomes desirable to each child. 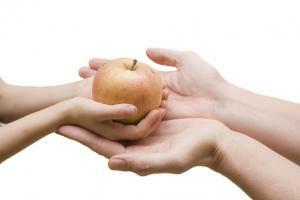 Even though children will want to keep the apple so they can win the game, they all must share it by passing. Take inspiration from the popular television cooking competition, Chopped. On the show, contestants are given a basket full of mystery ingredients which they must use to cook an amazing dish. For this activity, you will need to invite some friends over. Have each friend bring a mystery ingredient for all to use. Modify the game to include only family members by having each person choose a mystery ingredient from your pantry. Invite a few friends to your kitchen for the competition. When you send invitations, be sure to include a list of easy-to-use potential secret ingredients. Ask each friend to bring one or two secret ingredients. Each family should bring enough for everyone to have some in their dish. When friends arrive, put the ingredients into a closed basket. Once everyone has arrived, gather around a large island or table where each child has a set of utensils and dishes. Say 'Go' and let each child create a dish using only the ingredients in the basket. Children will have to share ingredients. After 10 minutes or so, take turns tasting each other's creations. 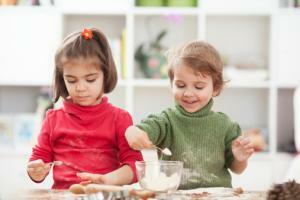 This fun activity can help children work on kitchen skills, better eating habits and sharing. Children will have to share the ingredients they each brought. In addition, this activity will help children see the value in a group effort when tasting the delicious dishes they made. Ever wonder what to do with all those plastic eggs once Easter is over? Why not use them to create some fun learning activities? In this simple activity, children will need to share half of their egg to make a whole egg of one color. Rearrange eggs ahead of time so each is made up of two different colors. 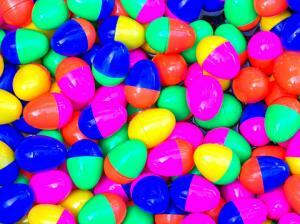 For this age group, the activity will work best if you exchange halves on two eggs of different colors. For example, make one egg with a blue top and purple bottom and its counterpart with the purple top and blue bottom. Divide eggs evenly between participants. Have the group sit in a circle. Explain the directions. The purpose of the game is to make each of your eggs totally comprised of just one color. One participant starts by asking another person for the color he needs for a particular egg. For example, if you have a green top with a red bottom you would ask the person with a green and red egg to trade bottoms with you. Go around the circle until everyone has completed the task. Children will learn they need help from others to complete the task. You can't make a blue egg in this activity without another person sharing their blue half with you. One of the benefits of sharing is helping each other reach a goal. Treasure hunts are a fun way to go on an adventure and can be adapted to any age group in any location. The shared treasure hunt gives children the opportunity to help a friend in need and share in a prize when everyone completes the task. This activity requires more planning and preparation than others. 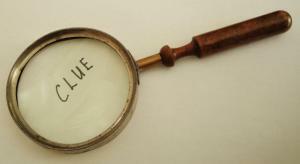 Using index cards or scraps of paper, add pictures of various items or locations within your house. Choose large, obvious pictures of items any child would be familiar with such as a couch or bed. When possible, use a picture that most closely resembles the color of your actual items because children in this age group tend to think literally. Make a set of cards for each child, using the same items in each set. Rearrange the order of items in each set, but have them all end in the same place. For example, one child might have to find the couch then the bathroom and end at the kitchen table while another starts at the bathroom then goes to the couch and ends at the kitchen table. Set by set, hide the clues in the appropriate locations. Once each child has found all of his clues, he should meet the other children at the designated end spot. If children get stuck, they can ask each other for help. Once all the children arrive at the end location, everyone can share the prize. In this game, each child is challenged to solve clues on her own for the majority of the time. However, to win the prize all the children must reach the end. Children will learn sometimes working together results in a greater reward. This game is a younger take on a gym game called "Screaming Viking." Children will have to find a partner to complete the charade of fisherman and fish. 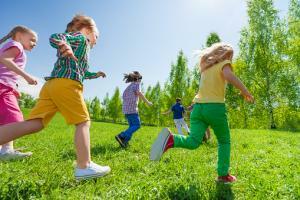 Ask all children to run in a circle going the same direction. When you yell "Go Fishing," children will need to find a partner and assume the correct stance, which is one person standing with arms extended in front like a fishing pole, the other laying on the floor in front flopping like a fish. Everyone who is successful wins the round. Repeat several times. Encourage children to look for a different partner each round. To win a round, children must collaborate. They will have to use positive communication skills to choose a partner and agree on who will be the fisherman and who will be the fish each time. A big part of sharing is learning to communicate needs and desires to others. Sharing is an important life skill for all children to learn and preschool-age children learn especially well through play, fun, and modeling. Sharing activities and games can incorporate all three elements to help cooperation feel like a rewarding experience.